Avia manufactures active wear, as well as active accessories like water bottles, socks, bags, and insoles, for men, women, and kids. The company’s goal is to provide premium active wear in which people feel good, perform their best, and are better able to juggle the demands of an active life, full of work and play. They also pledge to offer the latest innovations in sportswear, like moisture wicking technology and memory flex insoles. As an avid runner, I am always looking for the latest gear that will enhance my performance. I especially appreciate running clothes that stay put while I’m in motion. I have had the opportunity to test a pair of Avia Capris. Do they offer everything Avia promises to its customers? Do they meet my performance expectations? Keep reading to find out! The first thing I noticed about the Avia Capris was that they had substance. They felt thick in my hand, and I knew I wouldn’t have to worry about them deteriorating quickly or being see through. This was surprising to me, since the MSRP of this particular pair of capris is super affordable. The seams had thick stitching that laid flat against my skin. The waistband is wide and lays flat, just below the navel. These features helped the capris maintain a sleek and smooth fit from the moment I put them on until the last strides of my run. One feature that stands out in the construction of these capris are the tech pockets that run from the waistband down along the outside thigh. They have a very unique triangular shape and are made of mesh. What intrigued me about these pockets is that even though they are on the outside of the pant, they have no top closure. The stretchy mesh could accommodate an average size smart phone. However, even after walking around in these capris, I wouldn’t feel comfortable storing any device in the open mesh pockets. These unique pockets are best suited for taking along your ID, a few dollars, or an energy gel on your run. These capris are made of 92% polyester and 8% spandex, which give them a great amount of stretch to accommodate every curve of your body. In addition to the pleasing amount of stretch, they felt very smooth against my skin. It offered some compression, but not so much that I felt uncomfortable. I felt supported and secure in these pants. 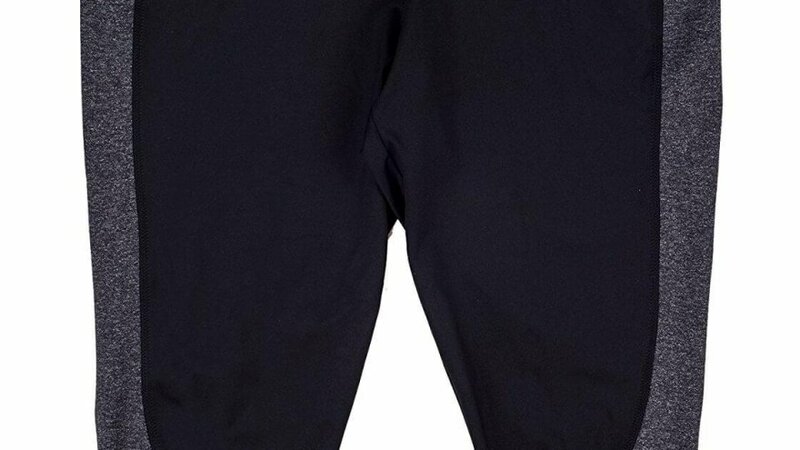 This pair of capris is made with moisture wicking material. Avia says that the technology of this materials “wicks away perspiration from the skin and transfers moisture to the fabric’s surface for evaporation, leaving you cool, dry, and comfortable.” I will say that my skin was dry during and after my run. The pants definitely wicked the moisture away from my skin. However, I noticed about halfway through my 4 mile run that the capris felt heavy. So, even though I was running on a warm and sunny day, the moisture didn’t seem to actually evaporate from the capris. I wasn’t completely uncomfortable, but I did notice a change in the weight and feeling of the pants as I got further along in my run. I am only 5’5” but my legs are really long (I have a 31” inseam). So, most capri-style pants hit my leg a little higher than they should. These were no exception, and landed just below my knee, which means they will probably be a regular mid-calf capris length on most people. Even at a shorter-than-intended length, they still looked smooth and sleek, and the triangular tech pockets elongated my legs even more and had a slimming effect. The contrast between the black pants and the gray mesh of the pockets is very fast looking. 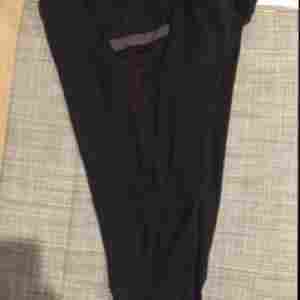 The waistband laid very flat, which looked flattering under even tight tank tops and tees. 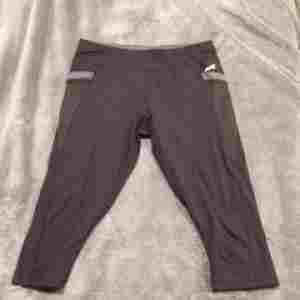 All around, these capris hugged my body just right, creating a sleek, polished, and athletic look for my run. The only area in which I would question the cut of these capris is in the hip/groin area. Although every other part of the pants fit really well, this areas was a bit baggy, and became even more so on my run. Even though the pants weren’t falling down, I felt the need to either pull up the waistband or pull down the legs in an attempt to unbunch the groin area. I do fluctuate between a small and a medium depending on the manufacturer, and these capris were a medium. I would be curious to see if the looseness of the material in the groin was still an issue with the small. The moisture wicking feature of these pants could use a tune up. Although the material did wick the moisture away from my skin, it never really evaporated, so I was left feeling heavy and a bit warm. Maybe using a more porous fabric or coating would increase the amount of evaporation that occurs after the moisture is wicked into the fabric. The dimension of these capris, especially in the hip and groin area, could be adjusted. Less material in this area would create a less bunchy look, and shouldn’t be too big of a compromise considering the awesome stretch of the materials. These capris are a great choice for a light workout, lounging around the house, or running errands. Although the lack of moisture evaporation makes me hesitant to wear these on long runs, I would definitely wear the Avia Capris for light workouts and throughout my daily routine.